Last week we talked about Gmail's spiffy new inbox-sorting tabs. Today let's look at another new feature, one that's just starting to roll out to users: a full-screen new-message window. 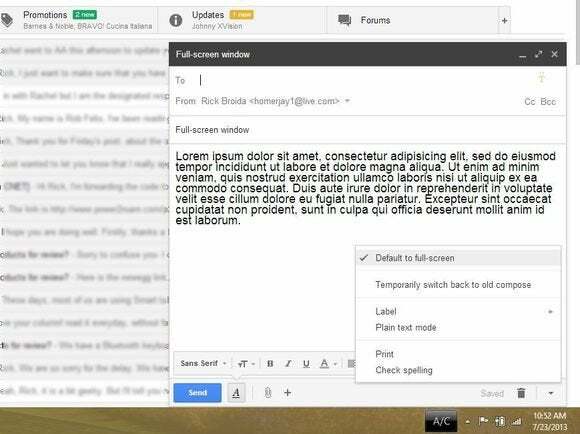 By default, when you click Gmail's Compose button, you get a window that appears in the right corner of the screen. Now there's a new option. In the top-right corner of that Compose window, you'll see three icons: Minimize, Full-screen, and Close. Clicking that middle one enlarges the window, though the description "full-screen" is a little disingenuous here: you actually get a larger, centered window that darkens the background. In any case, I greatly prefer that enlarged Compose window, and want it to appear every time I write a message--without me having to click the aforementioned icon. 1. After you click Compose, look for the little arrow in the lower-right corner of the Compose window. 2. Click that arrow, then choose Default to full-screen. That's it! Now you'll get the big window every time. If you decide you prefer the smaller window, just repeat the process. Speaking of which, which size do you prefer: big or small?